Time-management frenzy is taken to airports this time. 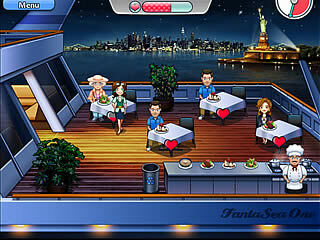 Jet Set Go is a typical fast paced game for the fans of the genre. You will have to do a lot of work to get to the last aiport and earn as many stars as possible. Filling the bars is what earn you stars that take you farther into the game. 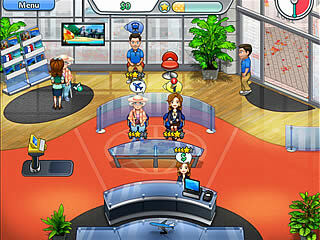 In Jet Set Go you are going to open and manage three airports. The second and the third one are locked. You are able to get to them only having reached four stars in the first one. The game is full of different tasks for you. First of all, you are going to be busy with helping people plan their vacations. You do that in very familiar way of dragging them to different stations. At those stations you can play various mini-games that will encrease their patience. Then there are also upgrades to be bought. Those are mainly new chairs, but you still need to do that. Another thing for you to do is to play separate levels in different locations that vary from airport to airport. By doing all that you will be filling three bars: excitement, appeal, and satisfaction. Filling those bars is what earn you stars that take you farther into the game. All of the tasks make a perfect mixture of activities that prevent the game from becoming monotonous. One of the flaws of the game is that the game seems to be a bit easy, despite all the variety of the tasks. Though the game will be perfect for the beginners inthis genre of the casual games. Another one is the evident lack of upgrades. Upgrading chairs isn't that much fun. As to the appearence of the game, it looks and sounds very well. The locations and characters are drawn very detailed and beautiful. Jest Set Go would be a nice example of a time-management game for someone new. This is Jet Set Go review. Download this game here.